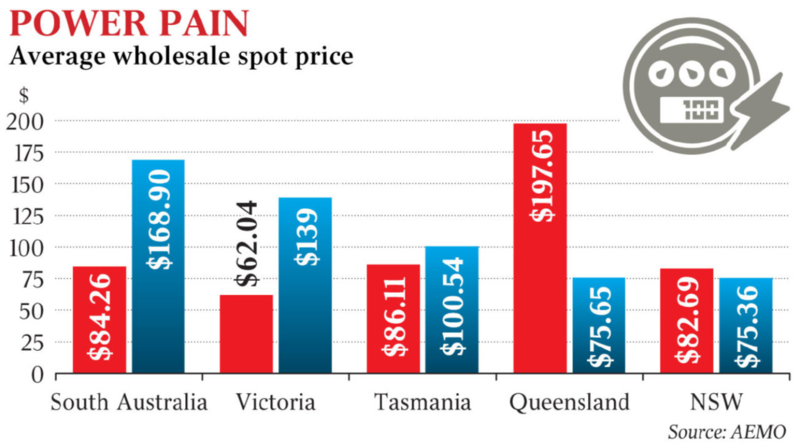 South Australia is renowned as a renewable energy ‘superpower’: by some strange coincidence, it’s also renowned for having the highest retail power prices in the world. For power punters battered with crippling bills, predictions don’t count for much. But still renewables rent seekers keep pumping the line that, one day soon, power prices will plummet. Here’s Donn Dears spelling out precisely why they won’t. What’s happening at the Energy Information Administration (EIA)? Are holdovers from the last administration producing reports that undermine this administration’s energy policies? The EIA has just issued its latest Annual Energy Outlook, AEO 2018, and it contains a plethora of misinformation. This and the next two articles will highlight a few of the more egregious items of misinformation. It’s a mistake for any business or political entity to rely on the EIA energy forecasts. It should also be noted that the focus of the latest annual energy outlook is on CO2 emissions. According to the latest AEO, CO2 emissions will remain constant through the forecast period ending in 2050. This substantiates the fact cited in Nothing to Fear that it’s impossible to cut CO2 emissions. The EIA predicts that the cost of electricity will decline by 2050 due to the low cost of wind and solar. If wind and solar generation increase, as forecast by EIA, the cost of electricity will increase … Not decrease. Holdovers at the EIA have assumed that the cost of wind and solar will be lower than the cost of electricity using natural gas or coal, and this is a huge error. 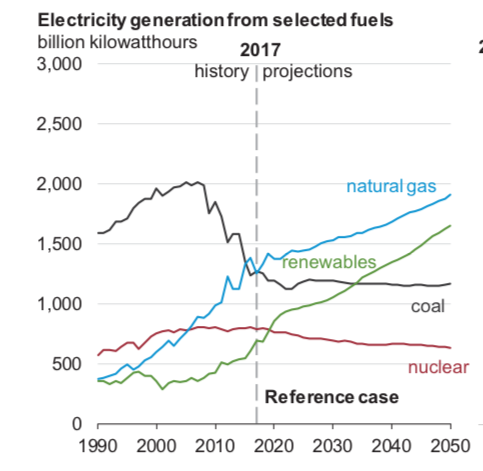 In addition, the EIA forecasts that wind and solar will dominate the growth in power generation, accounting for two-thirds of the growth in power generation. 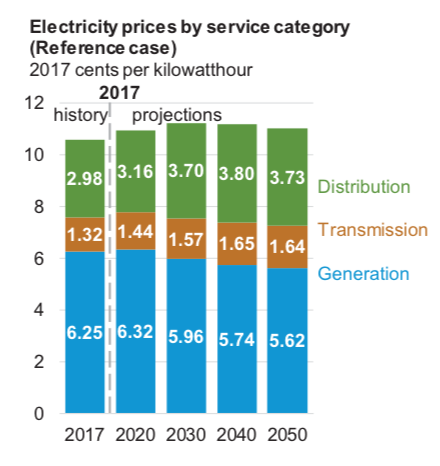 If the EIA forecast is accurate, it’s clear the cost of electricity will increase substantially. California, New York, and the New England states, which emphasize renewables, have much higher costs for electricity than do states that rely on coal and natural gas for generating electricity. Those facts are abundantly clear and were available to the EIA when it created this distorted report. These facts are accentuated by the EIA forecast growth for renewables, which is predominantly for PV solar, an extremely expensive method for generating electricity. Not only is PV Solar expensive, it requires storage, which, at a minimum, doubles the cost of electricity. In addition, the EIA has created a new measurement, Levelized Avoided Cost of Electricity (LACE) to justify its cost estimates. LACE uses marginal cost, which ignores total costs. See, The System is Rigged. The EIA has become an albatross left over from the Obama administration, distorting facts to promote renewables and the cutting of CO2 emissions. Any organization that uses the EIA’s forecasts are perpetuating misinformation and promoting distortions in the economy. It should be noted that Navigant Research has embraced the EIA information and published articles extolling the EIA forecasts. The EIA is an excellent example of what happens when ideologues assume responsibility for a government administration that is supposed to provide accurate information to the public. Hopefully, the Department of Energy (DOE) will take steps to eliminate the biases prevalent at the EIA. 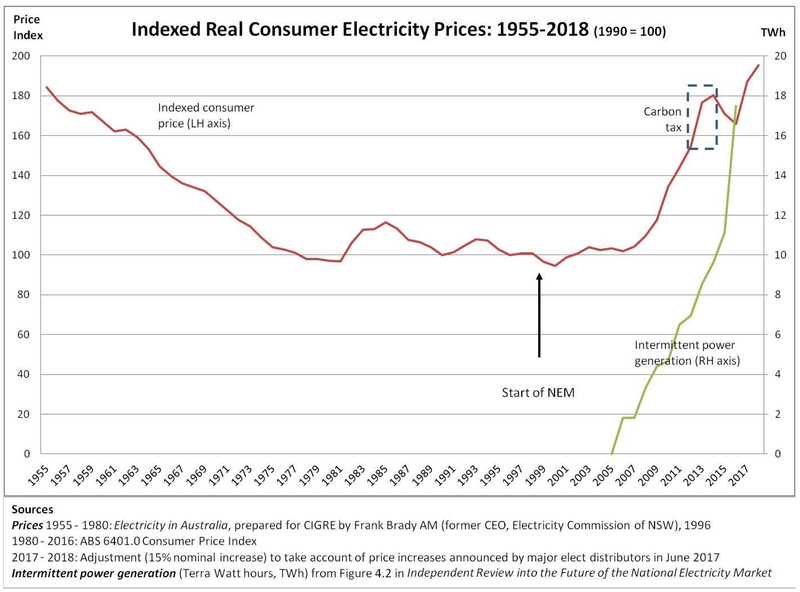 Having trouble making the connection between heavily subsidised, intermittent, market distorting wind & solar and rocketing power prices? See above the Australian experience (so far) and below for what’s about to happen in the US. 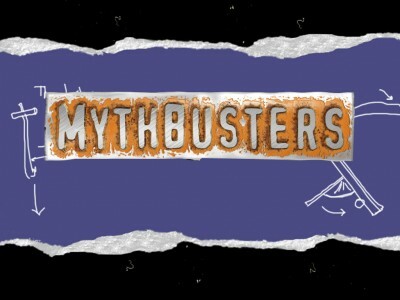 The Energy Information Administration (EIA) is providing misinformation to Americans in support of cutting CO2 emissions and promoting renewables. The following is another example of how the EIA is making unsubstantiated, misleading claims. 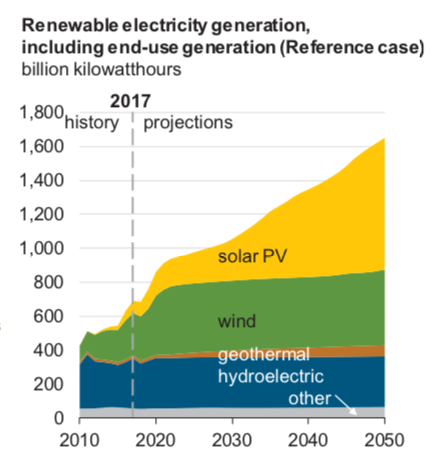 In this chart, EIA forecasts that PV solar, rooftop installations, will account for 200,000,000 KW of installed capacity by 2050. The average single, family-owned home requires about 8KW of installed PV solar capacity. There are approximately 75,000,000 such homes in the United States, of these, using 8KW for the average installation, 25,000,000 will have installed PV rooftop solar according to the EIA forecast. This is 33% of all single-family homes in the United States. On the face of it, this is an absurd number of installations. In essence, it says that virtually every single family home in the Southern US would have PV rooftop solar installed. While the cost of solar panels could come down, the cost of inverters and the physical installation won’t decrease by very much. Based on current costs, without subsidies, and the price of electricity, only Southern California (8 years) and Hawaii (3 years) require fewer than ten years to recover the cost of installing PV rooftop solar. Alabama 18, Arizona 10, Arkansas 23, Colorado 14, Florida 11, Georgia 15, New Mexico 11, Texas 15 and Louisiana 19. These PV rooftop solar systems are supposed to last about twenty years. 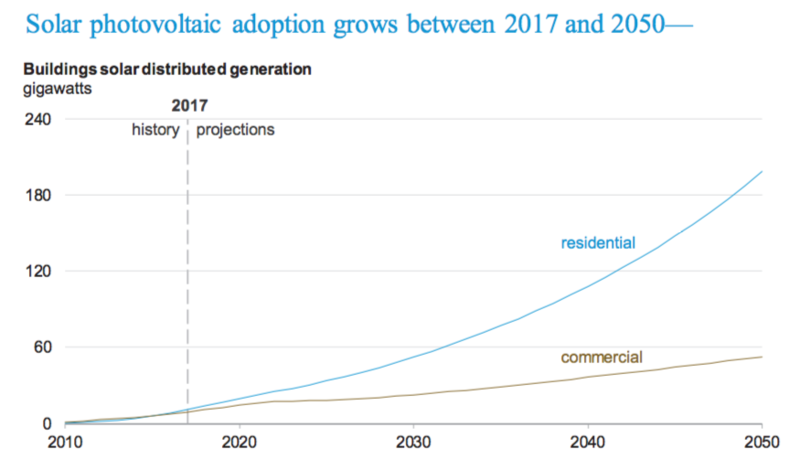 Any PV rooftop solar installed today will probably be replaced at least once by 2050. In addition, it should be noted that the roofs themselves need to be replaced every twenty years or so. Replacing roofs will require removal and reinstallation of the PV rooftop solar system unless the two events take place simultaneously. This infers government forcing the adoption of PV solar by propaganda and intimidation using the fear of global warming. It should be noted that the EIA, AEO 2018 makes similar unsubstantiated claims with regard to the use of energy by industry. The EIA is a rogue agency that the Department of Energy must get under control. As it stands today, no one should believe anything published by the EIA in its energy forecasts. 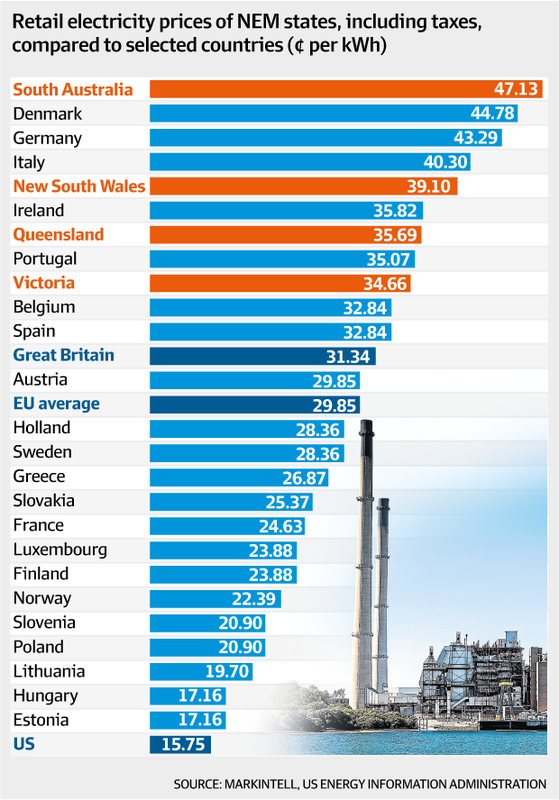 A large part of the future fiction of ‘roughly equal production costs’ lies in taxing the heck out of traditional power sources, classically with a so-called carbon tax. Then you kick in cash subsidies to the part time power generators and now you have ‘roughly equal production costs’. Except you don’t. I live in the San Gorgonio Pass, home to over 4000 gargantuan wind turbines and the required power lines strung-up in every direction. The Palm Spring area has some of the world’s highest electric bills. This was all made possible by our local Desert Sun/USA Today newspaper who did all the dirty work for the developers to get all of them permitted by relentlessly assaulting us with pro-wind propaganda on an almost daily basis that almost everyone bought. It is by far the worst thing that has ever happened here. Now we look at them and are forced to live among them. Please don’t let this happen in your community or you will eternally regret it and pay dearly for it. While solar may be a good idea to heat a water cylinder, that’s where it stops. While solar may heat your own water heater taking that energy to the boundary along the street into a neighbours property and heat there cylinder, forget it. There simply is not enough grunt/oomph to power your neighbour from your solar panels. Fans of expensive, unreliable, part-time electricity that has to be replaced at short (or no) notice by other power sources should look away now.